After several hours of negotiating the sodden plains of the Maasai Mara and with a mud covered van, we arrived at an area known as Bila Shaka. The name Bila Shaka in Swahili means “without fail”. 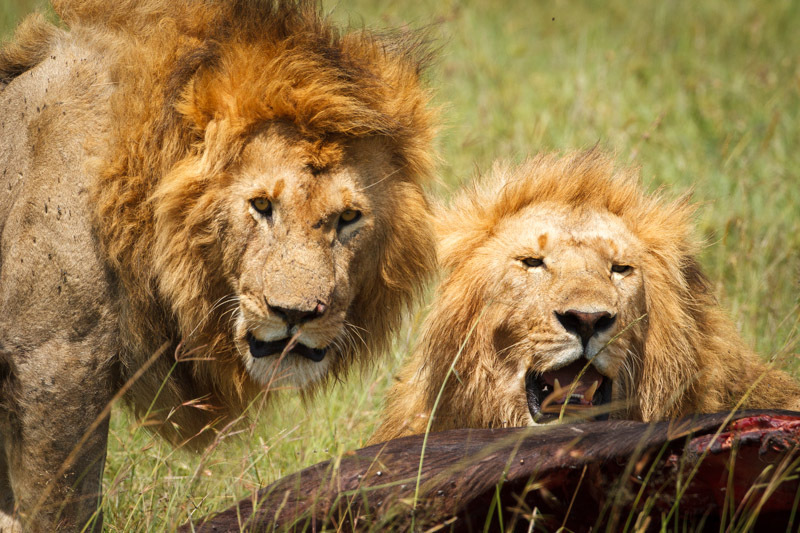 The locals and guides called it this due to the main lion prides continuously being spotted in the area and giving them a guaranteed lion sighting for paying clients. 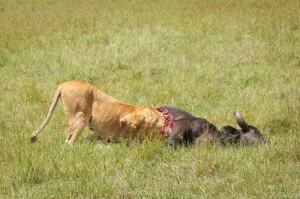 True to its name and within minutes of arriving we discovered a buffalo kill where a large powerful male lion was feeding. This was a fresh kill and we must have missed it being brought down by no more than 2-3 hours. The buffalo had been ripped open from the belly and it’s remaining organs were being devoured by scavenging vultures and storks, even the jackals were trying to muscle in on some free food. It’s not long in the wild for word to get around that there has been a large kill, more vultures soared above and one by one glided in to land like military fighter planes on an aircraft carrier. As the vultures pushed their luck by trying to steal meat off the carcus, a second large male run out from a nearby shaded bush and directed himself at the scavengers to chase the thieves away. Whilst we sat and watched the two kings of the plains guard their bounty, the same story would act out several times. The scavengers including the jackal, would creep closer to the buffalo to get some meat and when the lions decided they were to close, they would chase them off again. As the midday sun beat down on the African plains causing haze to dance across the horizon, two young female lions emerged from the distance. Drawn like a magnet to metal they headed straight to the buffalo. Suddenly the male lions got up, had a sniff to greet the females then moved away, it was obvious the female lions were part of our male’s pride. As the male lions moved to one side the females wasted no time, with each bite tearing the flesh from the buffalo with ease, each lioness got stuck in to the kill, literally head first! For the next hour and a half we watched these magnificent creatures gorge on the dead buffalo, and as they did so, the male lions relaxed in the shade of an open sided vehicle next to us. The lion was so close to the open side land cruiser, that the head of the lion was within six inches of the exposed legs of the onlookers. Every so often the lion would look up, turn his head and look directly at the man he was laying next to, after the third time of doing so, the driver guide of the land cruiser started up and moved forward away from the lion. However, the lion got up and followed the land cruiser to lay back down in the shade, the lion wanted to sit in the shade not the sun, how dare he move! With one final inquisitive look from the lion the land cruiser decided to move on completely, better to be safe than sorry, after all, this is the wild, but what an experience for the tourists in the land cruiser, a close encounter they won’t forget for quite some time I would imagine! After leaving the lions to finish off their lunch, it was time for us to find a place to park up and have our own lunch. Half a kilometre away from the lions was an Acacia tree that we decided to head towards and have lunch by. 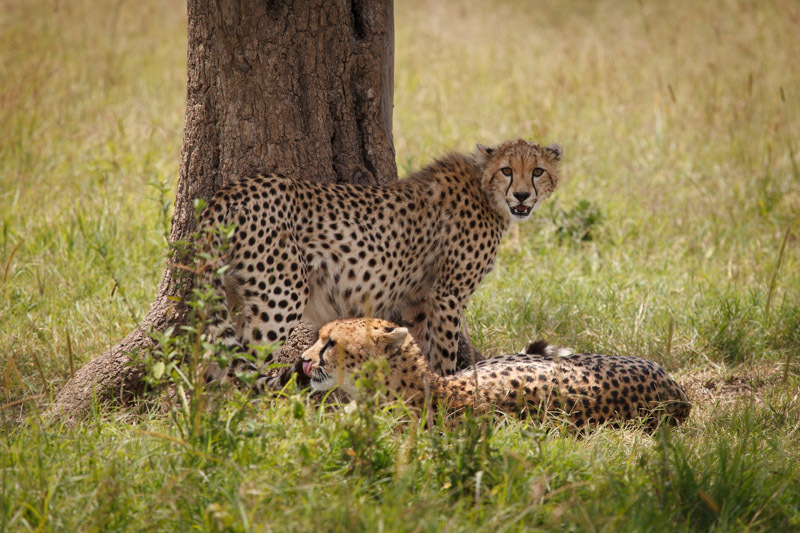 As we got closer to the tree we could see movement, to our surprise and good fortune we had discovered another kill, this time it was a feeding Cheetah and cub. We could not believe our luck, two kills in the same outing and so close together! The Cheetah had brought down its kill not far away from the tree, but as the sun was at full strength both the cub and the mum decided to go lay in the shade of the tree which was great as this presented many photo opportunities. As the Cheetahs rested under the tree we raided our lunch boxes and too had a well deserved rest. After we finished lunch Godfrey told us about a nearby hippo pool, such a fantastic place and located right next to the Musiara air strip, what a sight for guests of Governors camp arriving by air. As we pulled up to the edge of the marsh area the hippo pool was glowing bright green with dense vegetation in the strong sunlight. Like overgrown duck weed on a pond this vegetation completely covered the 60-70 meter span of the pool, but where were the hippos? Suddenly with a large snort and that familiar grunting noise only a hippo could make, several heads popped up out of the vegetation. 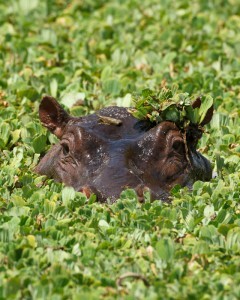 The hippos that had come to greet us were young, and as we watched them playing, slowly and gracefully a very large head emerged from the blanket of green. Looking straight down the barrel of my lens directly at me was the young one’s mother, perfect timing. I fired of a few shots from the camera and just knew I would have a great image awaiting me. As she rose from the vegetation, she had a small amount of vegetation on her head just like a crown, definitely the queen of the marsh! It was time to head back, we had a long drive and the weather was starting to turn, we needed to make it back to the three river crossing before the rain came in otherwise we could find ourselves getting stuck in the river or even not be able to cross the river and we did not want to be out in the Maasai Mara after dark…….